Eco-Logica Ltd was established in 1993 and since that date has worked with both public and private sector clients, the European Commission, NGOs and community organisations. Eco-Logica consists of a small group of people with broadly based experience in transport, urban and rural planning, environmental management, sustainable development and the practical implementation of high environmental standards in strategic and sectorally-specific policy areas. We have a particularly strong interest in transport policy and practice, international experience in this area and benchmarking. Eco-Logica has carried out many successful commissions in the last 5 years. The examples here illustrate the range of our expertise and nature of the client base. We publish World Transport Policy and Practice (WTPP, a quarterly journal which provides a high quality medium for original and creative work in world transport. 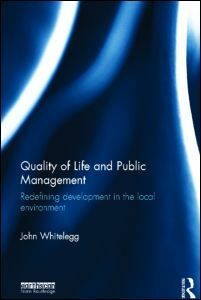 "Quality of life and public management: redefining development in the local environment"
This book is a no-excuses manual for a significant upgrade in quality of life for all citizens wherever they live. It takes hard look at Britain's record on child poverty, elderly poverty, public transport, walking and cycling, air pollution, road safety, renewable energy and resilience and concludes that things are bad. The book is hard hitting. There is no excuse for poor quality outcomes in the 6th richest country in the world. Each chapter in the book reveals that there are many places where outcomes are excellent (but not in Britain) and if high quality performance can be found in Sweden, Germany, Switzerland or Denmark then it can also happen in Britain. The reasons for Britain's failure are the same as in Australia or the USA and are embedded in an ideology and culture that worships market forces downgrades the importance of local government and underfunds public services. In Britain there are major failures that are in need of urgent correction. Britain is too centralised and local government is weak, unambitious and largely content with treading water, numbing bureaucracy and lack of vision. The book sends out a strongly positive message and spells out in great details just what has to happen to improve things. Everyone can live in a high quality environment with well funded public services. There are no technical, organisational or financial reasons why an excellent quality of life cannot be designed and delivered. The missing ingredient is political will and this will only change when we change our politicians. Eco-Logica Ltd., 53 Derwent Road, LANCASTER, LA1 3ES. U.K.